The A. Mickiewicz Junior High School in Vilnius, the K. Parczewski Junior High School in Nemenčinė, the St. R. Kalinowski Junior High School in Nemėžis and the M. Baliński Junior High School in Jašiūnai are among the leading Polish-language schools in Lithuania. On Tuesday in The House of Polish Culture in Vilnius winners of the contest “The Best School – The Best Teacher”were announced and awarded. The contest was organized for the 22nd time by the Association of Teachers of Polish Schools in Lithuania “Macierz Szkolna”. Traditionally, the winning schools has been selected in four categories – the city of Vilnius, the city district, the region of Vilnius and the Šalčininkai district . This year the A. Mickiewicz Junior High School in Vilnius, the K. Parczewski Junior High School in Nemenčinė, the St. R. Kalinowski Junior High School in Nemėžis and the M. Baliński Junior High School in Jašiūnai won the titles of best schools. Compared to the last year ranking, two schools kept a winner title – K. Parczewski Junior High School in Nemenčinė (among schools of the city district) and M. Baliński Junior High School in Jašiūnai (among schools of the Šalčininkai district). Józef Kwiatkowski, a president of the Association of Teachers of Polish Schools in Lithuania “Macierz Szkolna”, stressed that selecting the best teacher and the best school was not an easy task. “School as a state institution has been established to teach and to educate, but the results of educational work cannot be put in a single mathematical definition, they become visible after many years”, said Kwiatkowski and added that it was only possible to pick schools on the basis of learning results. Although school rankings are prepared also by Lithuanian magazines “Veidas” and “Reitingai”, the president of “Macierz Szkolna” believes that “our ranking system is the best one”. “It is the most objective. Why? Because we take into account the results of state exams in a given class in relation to the total number of high school graduates in this class”, explained Kwiatkowski. He stated that other rankings eg. took into account the results of exams in relation to the total number of exam candidates. He also added that ranking process of “Macierz Szkolna” was based on 20 criteria, e.g. results of all Matura exams, the number of exam candidates and of exams taken etc. Summing up the results of this year’s competition, the president said that in recent years high school graduates from Polish schools had the best results of the English exam. As he pointed, maybe because more attention was given by teachers of this language, and maybe most of the students were thinking about studying abroad or emigration. He also added that our students pass edwell Matura exams in Russian, and, recently, maths. In contrast, results of exams in physics, chemistry, biology, as well as history, have been quite poor for more than last 20 years. This tendency prevails in the whole country. Kwiatkowski also mentioned the decreasing number of Polish graduates. In 2016, 876 high school graduates finished education in Polish language schools in Lithuania – about a hundred less than in the previous year. However, he noted, the number of graduates is decreasing in the whole country. The president also noted the decrease of students getting into higher education. About 69,6% of this year’s graduates of Polish schools chose to continue their education (in 2015 – 71,1%). The president of “Macierz Szkolna” noticed that youth nowadays prefers vocational schools rather than higher education. The trend is nationwide. 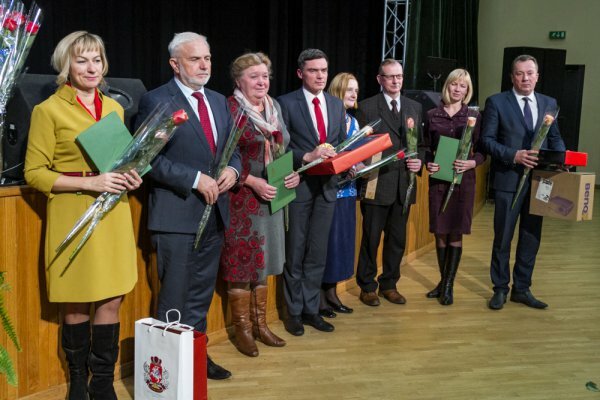 “Macierz Szkolna” awarded additional prizes to 7 schools. For the 14th time the best primary schools were awarded. Educational institutions were awarded for after-school activities – also participating in various contests and competitions run by “Macierz Szkolna” – and for students taking place on the podium in national and international contests and competitions. In this category 7 schools were awarded, including 3 of the Vilnius region – Junior High School in Mickūnai, M. Zdziechowski’s Primary School in Sudervė and Primary School in Dūkštos. Numerous awards were handed to teachers. This year, prizes were awarded to 107 teachers. The best of them are selected on the basis of their students’ exams results. Most awards were given to Russian (19), maths (13) and Lithuanian (10) teachers. On behalf of the parliamentary fraction of the Electoral Action of Poles in Lithuania – Association of Christian Families vice-president of the Sejm Jarosław Narkiewicz congratulated organizers and teachers. He stressed the meaning of the contest, being organized annually since 22 years, as it “shows the state of Polish education, compares schools and shows, in which direction these institutions have to improve”. He also informed that the Seimas had awarded Józef Kwiatkowski, the president of “Macierz Szkolna”, with the highest honor awarded of the Seimas for his lifelong work in the field of education. The price will be awarded to Kwiatkowski next week. In the ceremony took part the deputy district governor of the parliamentary fraction of the Electoral Action of Poles in Lithuania – Association of Christian Families Wanda Krawczonok, mayors of the Vilnius and the Šalčininkai district – Maria Rekść and Zdzisław Palewicz as well as representatives of the Polish Embassy in Vilnius. Maria Ślebioda, the deputy ambassador in Vilnius, adressing gathered teachers, said that “in hands of teachers in Polish schools in Lithuania lies the survival of Polishness”. “In Poland the role of Polish teacher is to enrich the language, to teach about the literary canon. In Lithuania, this role is greater and much more responsible, because the stake is much higher. The stake is whether the Polish language, culture, tradition and identity will survive”, said the deputy ambassador. She noted that teachers of Polish schools in Lithuania operated in challenging conditions. The fact that some of schools have to literally fight to not be degraded or transferred in less convenient locations makes the process of education even harder. She assured of the support of Poland and congratulated teachers their fortitude, determination and patriotism.